It’s Eid el Kabir and it did not come unannounced. As usual with me, I deliberated on the various places of interest that I should visit, given this gift of four (4) continuous work free days. The initial thought was focused on visiting Daura, a town that I had spent some of my early years. It is also the city from which the current President of Nigeria, President Mohammadu Buhari (PMB), comes from. The intent was to see how the town had changed over the years. I searched for the best connecting route to Daura and this would be by flying to Katsina and taking a taxi to Daura. I got online and tried to book a flight from Lagos to Katsina and soon realized that no airline has that route in its stock. I also looked for an alternate route, fly to Kano and then go by road to Daura. I got Egypt Air which planned to take me to Cairo first and then join a connecting flight to Kano for a trip of fifty four hours and a hefty price tag of $1,600! Obviously that wasn’t the right option. Then I got Arik Air, a better alternative. However, no Arik Air flight was planned to leave Lagos on Thursday to Kano. This did not look good. Daura will have to wait, till another opportune time. 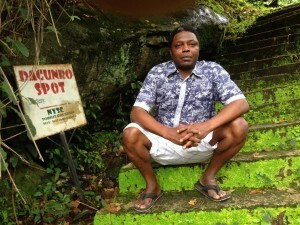 Well, I came up with another brilliant way to spend the days – a trip to Idanre and then to Oshogbo and Oyo. I have always been fascinated by the pictures of Idanre that I had seen. A little South Western Nigeria city located in Ondo State surrounded mainly by huge Igneous Rocks. The pictures were postcard quality and I wanted to experience the views myself. For me, the next question was how to get to Idanre. I have a love of adventure, I enjoy driving but am very afraid of long journeys on Nigerian Roads. Well, the roads are a notable cause of death for many travelers. Just less than two (2) weeks ago, an acquaintance of mine lost his life on the Lagos Ore Road in an accident, most likely a preventable one. Drivers have to cope with pot holes on the highways in addition to a total absence of Road Furniture such as signposts to alert on dangers and upcoming changes in road conditions. All these are in addition to the very high traffic on the roads. These were things that bothered me but not as much as the presence and antics of our Policemen, they can make the best of days become a nightmare. I have had my various encounters with these men in uniform and would do everything possible to avoid them. A glitter of hope came when I remembered that the new Inspector General of Police had announced the removal of all Police Checkpoints from our roads. Now, I need to think of the opportunistic Armed Robbers, these are lesser evils to worry about. It’s always an effort to get my frame off the bed each morning. Thursday 24th September was not different, in fact it was a little worse. I woke up to see the room full of sunlight, checked my time and noticed it was a little after 8am. I felt like having a little more sleep, turned around on the bed and faced the other side. I was soon off asleep. The room became uncomfortable and I came off my slumber only to realize that PHCN has “held” the power! Well, this is becoming the exception and not the norm, at least since “Sai Baba” took over the mantle of leadership in Nigeria. This got me thinking, power may be off for the rest of the day. I checked my time and it was already getting close to 10am. I got off the bed, said my prayers and determined that I would not sleep in Lagos that night. Idanre, here I come. I gathered the little things I thought I would need for the trip – I am not the best back packer out there but I do get by. I was soon out of the house and got into my car, the trip has started. It was a little past 11:30am. Getting out of Lekki deserves some dexterity in driving and I am mastering this challenge each day. It took some time but I got out of Lekki and drove Eastward. The plan was simple. Drive to Epe, join the Sagamu Ore Expressroad at Ijebu Ode and get to Ore. Make a diversion northwards at Ore to Ondo and find my way to Idanre. A lot of things are changing in Nigeria. I called my Junior Brother and informed him of my impromptu travel. It wasn’t alarming to him, he has gotten used to such trips and notices. He wished me safe trips and promised to call often to check on how I was progressing on the journey. As I set out of Lekki, the heavens opened up and the rains came pouring down. I knew that this was an endorsement from God for the journey. I also knew that it was his way of warning me to be very careful on the roads – wet and slippery, they bring added dangers for motorists. I was soon out of Lekki and in Epe. I took the right and went in through Epe Township snaking my way to join Ijebu Ode. I had time on my hand and I kept reminding myself that the destination was not as important as the journey. I made it to the Sagamu Ore Road and the rains abated. I took the right and headed eastwards looking forward to getting to Ore. Not much has improved on the road, a few pitches here and there and numerous pot holes. I soon became adept at maneuvering around this, taking sudden swirls here and there and it all reminded me of the computer games that my son plays. I got to Ore and I was hungry. I took my car off the road to one of the roadside Cafeteria and ordered a plate of Eba with Egusi. It was not the best of choices but my hungry tommy did not reject it. At Ore, I asked for directions and took the Left turning which would lead me to Ondo town. The rainfall had done some havoc here. At Ajue, a settlement on the road, the rainwater has washed onto the road and for those unfamiliar with the road, we had to wait to be sure it was motorable. It was just brownish water all over! I got to Ondo uneventfully. Then I saw a rock. This was a break from the undulating plain that had accosted my sight all the way from Lagos. I stopped and took a few pictures and continued. I soon got to Adeyemi College of Education, or pardon me, it is the Adeyemi University College of Education. My Dad passed through this institution in the forties or so and I diverted from my trip to take a tour of the school. My Dad is not around anymore so I missed the opportunity of calling him to find out how much the institution had changed from when he was a student. I got to the Art College and there were sculptures – Iron and Cement on display – showcasing the projects of past students of the school. I was unimpressed. Not with the sculptures but with their presentation. Weeding the environment and a little investment in a building would have been befitting to these sculptures. It would be an additional money spinner for the institution. I took some pictures but my attention was deeply caught by the Iron piece titled “The menace of Okada”. As I drove out of the area, I saw the unbelievably ugly and stomach turning work of a student which ought to have been a master piece. It was of a bird of prey feeding its young one in the nest, on top of a rock. The concept was world class but the delivery was at best ordinary. I visited the Olusegun Obasanjo Hall and then headed out of the gate. As I continued on my journey, I kept on thinking about my Dad. He hailed from Ibadan and he schooled here, in Ondo. How did he make the trips? As a young man, what a sacrifice! I became grateful for his sacrifices and continued with my journey. I came to Owenna and was advised to take the right turning to get to Idanre. At the Owenna Junction, on the Ondo Akure Road, I got the impression that Nigeria was at war. The heavy military road blockage could not go unnoticed to any traveler! My knowledge of current affairs could not help me situate which war we are fighting that necessitated this road presence. A few meters after leaving Owenna, I started seeing the road markers, guiding me to Idanre. It states “17kms to Idanre Hill Resort”. I knew I was close and my sense of excitement got a boost. I soon came across a well manicured and flowered piece of land on my right. It stood apart from the rest of the terrain and I just had to stop to find out what this was. I soon realized that it was the Ondo State Golf Resort. This knowledge created more questions than answers. Golf in Ondo State! In the middle of nowhere! The people in the area have a need for better projects than the elitist Golf Resort. I took out my camera and took a few snaps and continued on my way. As I turned the corner, I saw it. It was the impressive first sight of the hills of Idanre. It was more than words can describe. The view was poster perfect. It dwarfs the scenic view of table mountain in South Africa, if the efizzy that comes with that is removed from it. I no longer could wait. If this is the view from the outskirt of the town, the views from the town would certainly be much better. I drove into the town, there was no pomp and pageantry. Not that I expected any but this being Sallah day, I was expecting to see “Owambe” parties around the town. I transverse the city on the straight road that I had been following from Owenna and the signposts on the road soon led me to the Idanre Hill Resort. Disappointment was an understatement. All my zeal became deflated! There was nothing remarkable with the resort but the hills. I parked the car and pulled my weary frame out of it and sought directions to the reception. I introduced myself to the receptionist and asked for a room for the night. The lady was polite and she offered to take me to the two (2) challets that were available – Ile’rigi. She opened the door to the chalet and the stench that confronted me was nauseating. I requested that the lights be turned on but she mentioned that all the bulbs were burnt and no light. I switched on the torchlight from my phone and soon requested that we take a look at the other chalet. The sights from the other chalet wasn’t different from that of the first. She mentioned they could clean the challets up and this would cost me N35,000.00 per night. I was at a loss on where I would sleep for the night when she introduced me to the manager of the facility. The man, with an unmistakable Ondo tribal mark on his face, understood my disappointment with the facility. He explained that the facility was in-between a management transition and suggested one of the staff to take me back to the city to Lodge at Rock Valley Hotel. I appreciated his honesty and promised to visit the facility again in the morning when I would go to the top of the rocks. Rock Valley Hotel wasn’t anything special but it offered a warm cozy bed for the night. Somehow it was fully booked for the night but they managed to get me a room. Once I was checked in, I decided to drive around the city and it was then that the words of that artist in Adeyemi University College of Education came hunting. Yes, the menace of Okada Riders. I was taking a left turn into a major road when an Okada Rider, following me closely, lost control of his bike and within the twinkling of an eye, somersaulted and his bike ran into the crowd. My car was missed narrowly. I came down to attend to the Okada Rider and there also came the crowd. Miraculously, he had no fractures but a few bruises especially around his foot. Not far from the scene was a chemist. We got to the chemist and got first aid applied to him and I was soon on my way. It was just God otherwise I would have suffered broken tail lights or the rider would have had fractures and that would have necessitated a visit to the hospital with the attendant high bills. I went round the city and found out that it was bigger than I thought. There was a downtown area and commercial activities were ongoing despite that it was getting late in the day. I turned back and headed for the Rock Valley Hotel. I slept deeply and did not know when it was morning. I called the restaurant and requested for a breakfast of yam and eggs with coffee. It wasn’t remarkable but was palatable. My phone rang and the person on the other side of the line said “this is Manish”. I know that voice, it was Manish. We’ve not spoken in over a year and chatted a while, to catch up on events that have transpired in the past year. The call lasted for almost 30mins and then we said our byes. I looked at my time and saw it was approaching 10 in the morning. I headed out for the resort. I needed to climb the rock, I just had to. As I drove out of the hotel, I noticed a medium sized SUV pulling out of the hotel as well and it followed me. Could it be that I have kidnappers trailing me? I glanced through my rear view mirrors and noticed that the occupants of the vehicle were not interested in me. I soon forgot about them. The drive to the Hill Resort was easy – it was a straight drive from the hotel. As I maneuvered my vehicle to a parking spot on one of the outcrops in the resort, I noticed that the other vehicle had also pulled into the resort. The occupants of the vehicle, two (2) folks of European descent along with about four other Nigerians alighted and were giggling, engrossed in their chat. I walked into the reception. This time I noticed the layout of the reception and its internal décor. It looked welcoming and suitable to such a resort. The lady, with her thick Ondo dialect welcomed and remembered me from the previous night encounter. A lanky young man was assigned to me as the tour guide. He advised that I should get a bottle of water as the trip up and down the hill may take more than an hour and would be 660 steps. I wasn’t scared. No I couldn’t be. I had gone up the steps on the Great Wall of China, nothing was expected to be more daunting. We started the ascent in earnest and the young man was leaping ahead. With a lot of effort, I pulled myself up the very first 220 steps, panting and my heart sending me all the red alarms, I had to call for a stop. We were by the side of the first sit out and I took my rest, looking at the town spread openly downhill similar to cassava that is spread out on the ground to dry. I engaged my tour guide in discussions about how long he had been working at the resort. He held nothing back. It was a story of woes and doom – of government ineptitude and lack of care to the resort as well as to its employees. He talked of having not received a pay in seven (7) months. After feeling sufficiently rested, we continued on the uphill climb. I did call for a break at least two (2) more times before we reached the top of the 660 steps. Mid-way up we reached a narrowed pass through two rock boulders. I was told by the guide that the point was “Dagunro Spot”. 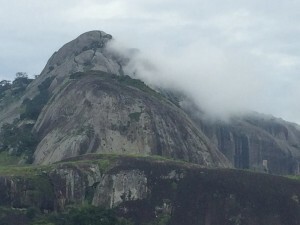 There was a marker at the point and the tour guide told a story of how Dagunro, an ancient progenitor of the Idanre people used the spot as a look out. The story was that for any approaching war against Idanre, Danguro will chant some words and the rocks around Idanre would close and the approaching warriors would be unable to find their ways into the town. I had hoped that getting atop the last step would mark the end of the climb, it did not. Apparently to generate some fancy number, the steps were limited to the 660. They could have been more. We soon took a right turn and came to an open clearing on top of the rock. The view that accost the eyes was simply amazing. 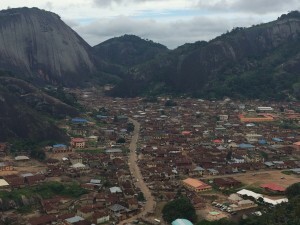 One could see the whole Idanre City laid out flat below and surrounded by the rocks. Everywhere I looked, I simply was lost for words, how were these rocks formed and why are they predominant only here in Idanre? I took some selfies and asked the guide to take me some as well. Not far in the distance were a set of building made of sandcrete blocks. They must have seen better days but their current appearance was derelict and looked totally unkempt. I approached and the sight I saw made me scared of going inside. My tour guide informed that a group does come annually with its generator and rent these chalets. If these were better kept, I would love to have spent a week in them but they were not. I felt a rush of sadness through me. It had to do with the enormous tourism potentials that this place commands and yet the place is derelict and the people are wallowing in poverty. I thought of the magical moments we had on the Cape Town’s Table Mountain, of the various businesses that thrive just because of this mountain. Yet, here lies a greater attraction than Table Mountain and we had failed as a people to turn it into a cash cow!. I felt I had seen enough, despite the urging of my guide to go further uphill. We were soon on the journey downhill. Lost in my thoughts and unwary of the slippery nature of the steps, I slipped and was soon rolling downhill. I managed to pull myself together and stopped the fall. I managed to escape unhurt. Thereafter, I descended with a lot of caution. By the time we got back to the base of the resort, more than an hour and a half has passed. I greased the palms of my tour guide and said my goodbyes. As I got back into my car, I noticed the presence of a lot of people. In fact, there were two bands of performers, preparing to get on a stage. Close by was a bus belonging to the culture ministry of the state. It showed there was a performance about to happen. I got out of my car and then I hear my name shouted out. I turned and there he was, Eric! Eric and I had done all our possible best to meet in Lagos but we couldn’t just get to working this out. Of all places, here we were both in Idanre. We exchanged greetings and I got introduced to his friends. We got talking and took a walk round the resort. Finally we drove off together, Eric to Lagos. Myself? It was to conquer another land hitherto unvisited by me. As I drove off, I kept thinking about the missed opportunities. My tour guide had told me that the ower of La’Campaigne Topicana, a chain of tourism resorts in Nigeria, had approached the government of Ondo State to take over the management of the Idanre Resort. It was reported that he was given the consession. Based on this, he had started works on getting the resort into shape – creating a new bar, furnishing the reception as well as holding the last Idanre festival. However, a dispute ensued between him and the governor and the concession was withdrawn. No wonder the resort was in the shape that I met it.